Are your blog posts irresistibly sharable? Do you want more people sharing your content across social channels? Blog posts are the hub of your social media presence. In this article you’ll discover how to use your blog to improve social media shares on Facebook, Twitter and Pinterest. Many bloggers are discovering something interesting: When they update Facebook with a link to a new blog article, fans are leaving comments on the Facebook update instead of the blog. 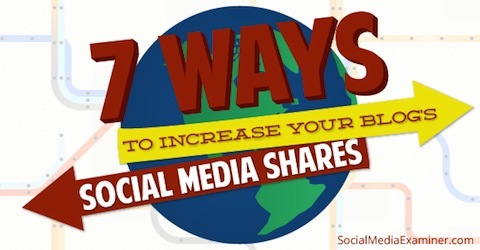 Find out how you can improve social media shares from your blog. If this is happening to you, take advantage of it. Replace your existing blog comment system with Facebook comments. 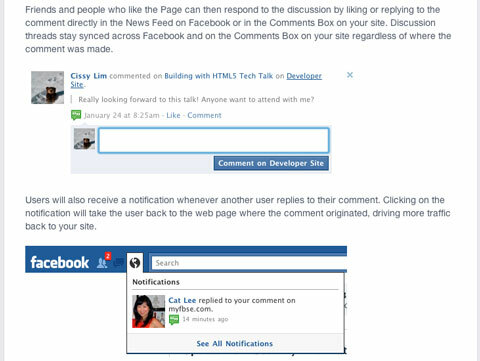 Facebook comments integrate comments from both your blog and Facebook. In other words, when someone comments on an article via your blog, the comment shows up on Facebook. When someone comments on your Facebook update linking to your post, the comment shows up on your blog. Make your blog comments more visible to Facebook users. You can also use this tactic with Twitter. The Twitter Mentions as Comments plugin searches for tweets about your blog post, and then adds those tweets to the original post as comments. This kind of social proof shows others that people are talking about your blog even if they aren’t doing it on your blog, and it encourages more sharing. Readers like things to be easy. If you make it easy for them to share, they’re more likely to do it. To that end, social sharing buttons are the basis of integrating social media into your blog. The social share bar on Social Media Examiner makes sharing easy for readers. Whether it’s the Tweet button at the top of this post or the rows of share buttons at the end, you need them to have any chance at increasing social sharing. As for which buttons to include, consider your audience. Which networks are they using? Which ones are they avoiding? If you’re not sure, it’s OK to include all of the sharing buttons for a little while. Soon you’ll be able to tell which options your audience is using most, then you can take the others off. Linking to a high-quality resource, quoting an influencer in your niche or even interviewing other bloggers and experts are ways to increase your credibility and your social media mentions. The truth is that those you mention in your blog posts are likely to share with their own networks. 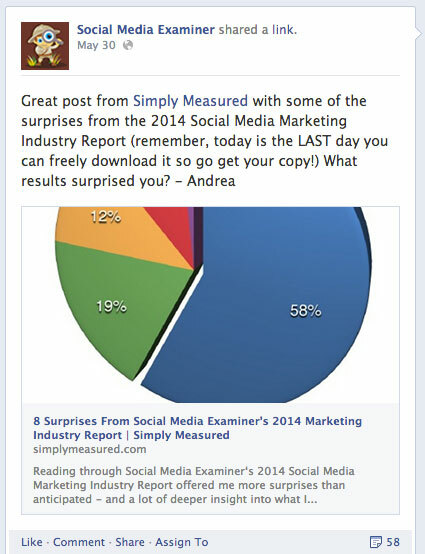 Social Media Examiner shared a Simply Measured post that mentioned the 2014 Social Media Marketing Industry Report. Quote experts or fellow bloggers in a post, and they will likely share it on all of their social networks. It’s a good way to reach new audiences. Many websites offer free resources to readers who sign up for an email subscription. Why not do the same for your blog content? If you have popular posts with consistent traffic, “lock” them and ask readers for a share before they can access the content. While this is an effective strategy, it’s a little counterintuitive because it requires people to share an article before they’ve read it. To alleviate this, don’t lock up the entire article. Instead, reveal a strong introduction that entices the reader to share to continue. WordPress sites can use the Social Locker plugin to lock a post. Readers can unlock it by liking, tweeting or pinning that article or by giving it a +1. Restricting access to valuable content can lead to a lot of social activity. Require visitors to share your content before reading it. These days it’s all about the images. 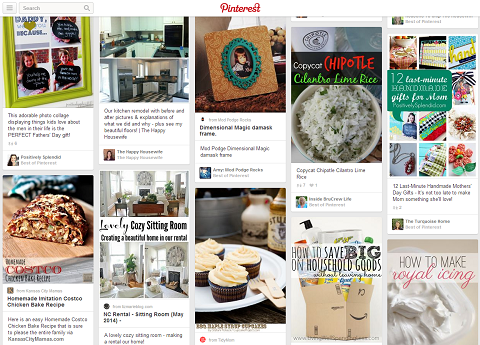 Every social media network from Pinterest and Facebook to Google+ and Twitter emphasizes visual content. That means each one of your blog posts should have an image that inspires your readers enough to share it. Attractive images entice more readers to share your content. What makes an attractive image? Something that’s clean, professional and includes text that explains what your post is about. Remember that people share content that reflects well on them. Make your images positive, inspirational and educational. Part of promoting your posts (and driving social media engagement) is making sure you have something worth sharing like a quick, pithy statement that adds value to your audience. 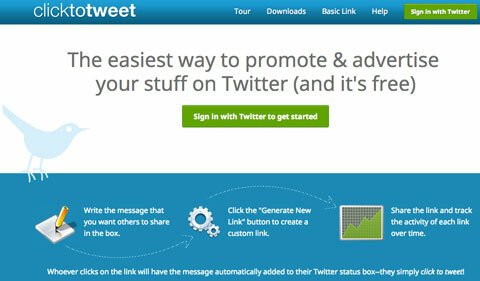 Use a plugin to let people share your content easily. Tools like Highlighter or ClicktoTweet make it easy for readers to grab a takeaway from your blog post and spread it through their own networks. When you use a tool that tweets for you, keep in mind that the message should be a truly helpful takeaway and needs to pack a powerful punch in fewer than 140 characters. Do you run giveaways on your site? If so, offer extra entries to your giveaways when your entrants like, tweet or pin something on your site. It can lead to a huge social media response. For example, if you’re trying to build a following on Twitter, ask entrants to follow you to get an entry, and then provide another entry if they tweet about the giveaway with your hashtag. Tools that manage these giveaways make it easy on you and effortless for your participants to complete the required actions. These tools will even randomly select your winner. Ask for more social engagement in exchange for more entries. Want to get even more social interaction with your giveaway? Partner with two to five other bloggers to host a joint giveaway. In a joint giveaway everyone pitches in to provide a single big prize, and then promotes the giveaway across all of their social media channels (including their blogs). All partners get exposure to new audiences and increase fans, followers, likes, shares and blog readers. Be sure to review the terms and conditions of each social media network as some don’t permit asking for actions as entries. For example, Pinterest has strict rules regarding giveaways and contests. With a few plugins, sharable images and some strategic partnering, people will be sharing your content in no time. When you make it easy to share, people are more than happy to spread the word (especially if the content makes them look good). Each share, like or comment bumps up your overall social media metrics and can lead to new fans.